Using data primarily gathered by SOFIA, NASA’s Stratospheric Observatory for Infrared Astronomy, a team of astronomers has detected the presence of substantial amounts of material on the surface of Ceres that appears to be fragments of other asteroids. This is contrary to the currently accepted surface composition classification of Ceres, suggesting that the largest body in the asteroid belt between Mars and Jupiter is cloaked by material that has partially disguised its real makeup. Ceres is considered to be both an asteroid and a dwarf planet, the only dwarf planet located in the inner solar system. Astronomers have classified Ceres, as well as 75 percent of all asteroids, as belonging to composition class “C” based on their similar colors. But the mid-infrared spectra from SOFIA show that Ceres differs substantially from C-type asteroids in nearby orbits, challenging the conventional understanding of the relationship between Ceres and smaller asteroids. Ceres’ surface is contaminated by a significant amount of dry material while its the area below the crust contains essentially water-bearing materials. The mid-infrared observations revealed the presence of dry pyroxene on the surface probably coming from interplanetary dust particles. The Internal structure of the Dwarf Planet Ceres was derived from the NASA Dawn spacecraft data. No image credit. 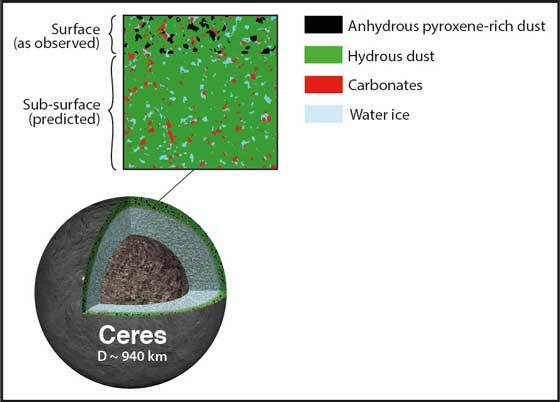 To identify where the pyroxene on the surface of Ceres came from, Vernazza and his collaborators, including researchers from the SETI Institute and NASA’s Jet Propulsion Laboratory, turned to interplanetary dust particles (IDPs) that are commonly seen as meteors when they streak through Earth’s atmosphere. The research team had previously shown that IDPs blasted into space by asteroid collisions are an important source of material accumulated on the surfaces of other asteroids. The implication is that a coating of IDPs has caused Ceres to mimic the coloration of some of its dry and rocky neighbors. Ceres and asteroids are not the only instance in which material transported from elsewhere has affected the surfaces of solar system bodies. Dramatic examples include the red material seen by New Horizons on Pluto’s moon Charon and Saturn’s two-faced moon Iapetus. Planetary scientists also hypothesize that material from comets and asteroids provided a final veneer to the then-forming Earth – a coating that included substantial amounts of water plus the organic substances of the biosphere.